Mayme Viglicky, 98, of Schuyler, died Wednesday, February 7, 2018, at david place in David City. Mass of Christian Burial Monday, February 12, 2018 10:30 A.M.
Mayme A. Viglicky was born on April 15, 1919 to Joseph and Antonia (Chvatal) Jaros. 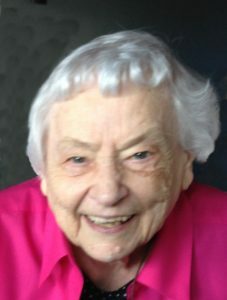 She attended school at Abie Public and graduated from Schuyler High School in 1937. Prior to her marriage, she taught in the area. On August 17, 1938, she married Leonard Viglicky at Sts. Peter and Paul Catholic Church in Abie, Nebraska. They resided near Edholm until 1998 when she moved to Schuyler. She enjoyed cooking for her family – dumplings among her best work. Those brownies in the Christmas tin never disappointed. Every birthday or celebration in the family had to have balloons. Her greatest beauty was her faith and her rosary. Right up there with her faith and rosary were her beautiful twin great grandchildren, Matt and Molly. She helped care for them and was a constant in their lives until her death. She was simple, gracious and faith filled. Mayme is survived by one son, Jim Viglicky of Schuyler, son-in-law, Marvin Slavik of Schuyler, one granddaughter, Susan (Gregg) Coghill of Omaha, great grandchildren, Matt and Molly Coghill of Omaha, and one sister, Olga Sims of Schuyler. She was preceded in death by her husband, Leonard, daughter, Joyce Slavik, sister, Irene Vanek, brothers in law, Jerry Viglicky, Harold Coontz, Adolph Egr, Louis Vanek, sisters in law, Rose Egr, Alice Coontz, Libby Viglicky, and many nieces and nephews.